main objects is ideally to create a balance between creative direction and business goals. The aim of the studio is to explore, experiment & evolve by creating a textile network divided in 4 main sectors: Industry, Co-Working, Textile Art, Product design. 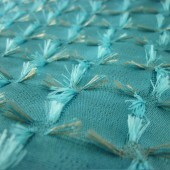 2004-2008, Textil Design (graduated with honors), Universidad Iberoamericana, Mexico City. 2008 - “Marimekko Dress”(collective exhibition), Museo Franz Mayer. MEXICO CITY, MEXICO. 2010 – “Newspaper” Textile Auction 20 x 20, Centre des Textiles Contemporains de Móntreal. MONTREAL,CANADA. 2011 - “Textile Braille” y “Chilango”, Sexta Bienal Iberoamericana de Diseño, Palacio de Bellas Artes. MEXICO CITY, MEXICO. 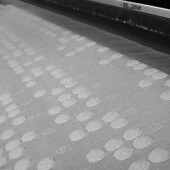 2012 - “Textile Braille”, BID_12, Bienal Iberoamericana de Diseño, Centro de Creación Contemporánea. MADRID, SPAIN. 2013 - “Textile Braille”, roaming BID_12, IAAC Pablo Serrano – Instituto Aragonés de Arte and Cultura Contemporáneos. ZARAGOZA, SPAIN. / Centro de Arte Contemporáneo de Quito. GUAYAQUIL, ECUADOR. 2013. "Oruga" Revolución Cultural, Hospicio Cabañas, GUAD., MEXICO. 2013 - “LILILAB”, Artisan among artists 3.0, Museo de Arte Popular . MEXICO CITY / NUEVO LAREDO / TIJUANA, MEXICO. 2013. "Compilation" Design: Strategies for social welfare (collective exhibition), UIA, MEXICO CITY, MEXICO. 2014 - "Lasso & Textile Braille", A Design Awards & Competition, Mood, COMO. ITALY. 2014 - "Sacks, Sommelier, Campos de Agave Fields, Falvour of foam,Chocolate Fondue ", Gourmet Show , WTC. MEXICO CITY, MEXICO. 2015 - "Marigold Batman”, Batman 75th Anniversary “Batman through mexican creativity”, MUMEDI. MEXICO CITY, MEXICO. 2016 - “CALEIDOSCOPE” Trend Saloon, Habitat Expo, WTC, MEXICO CITY. 2015. “Batman a través de la creatividad mexicana”/ Exhibition & Auction Catalogue, Warner Bros Entertainment Inc. MEXICO. 2013, Museo de Arte Popular/ Mexico City. fabric mills print and jacquard, achitectural firms, interior designers, industrial designers, commercializers for hospitality. 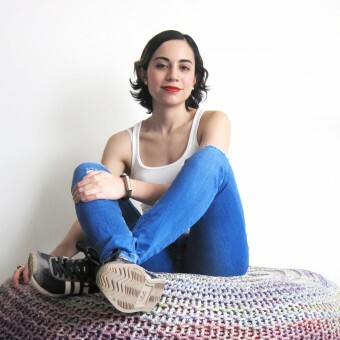 Press Members: Request an exclusive interview with Cristina Orozco Cuevas.